There are two departure points for this little excursion. 2) Joseph Kerman’s departure from the realm of the living, earlier this year. In Opera as Drama Kerman looks at a great many works while presenting his thesis that “the composer is the dramatist”. It’s a seminal idea, whether or not it‘s always true. I want to zero in on a small part of the book, a chapter called “The Dark Ages”. Kerman’s viewpoint –that the baroque is a little known period of “unparalleled dramatic fatuity”–is dated. I don’t deny that I bristle at the way he characterizes the artists of this period. One of the big challenges in our encounter with a score (whether we‘re reading through it or hearing a performance) from the baroque is all too familiar from encounters with new music (and one of which i must be mindful of, encountering new operas last week from Fawn Opera, or as i listen to a new CD by Jocelyn Morlock). We won’t know the music, nor will the performers, which changes everything. A score is like a puzzle that must be solved –and can be solved sometimes in several ways–before the performance happens. We may mistake the effects we hear –the misadventures or failed experiments of performers–for the work of the composer, their challenges perhaps still too daunting. We may not appreciate how familiar & mainstream works come to be known inside out by performers as they grow up, as part of their pedagogy and therefore as touchstones of eloquence & virtuosity. Before singers learn how to float the high note at the end of an aria there may be years of struggle that are like a kind of debate, as different approaches are tried out. Now imagine that we as modern performers, scholars and listeners come upon a body of work from a composer without having heard others sing this repertoire. We can only work from what we’ve done before as singers, gradually figuring out new approaches. Lully is such a composer, one among many whose popularity –more precisely, their lack of popularity–has made him obscure where he was once the most popular in his city. How to decode his scores with perfect fidelity to the style of the time–that is, how to read the music and understand the various implied and unwritten requirements in the score that are part of the consensus of musicians & singers from that time– is surely impossible. All we can do is hope that scholarship informs the efforts of the musicians, who read contemporary accounts, who stare at the scores & listen to what other musicians are doing. Each performance is like an experiment, a speculative assembly of notes & words & especially assumptions. Even when we’re dealing with music from long ago, there can be a consensus, admittedly among that very small group of performers exploring the repertoire, such as William Christie, David Fallis and others. That’s all a preamble to looking at what Kerman said, or rather, looking at how Kerman looked at Lully. Here’s the third paragraph of “The Dark Ages” chapter in its entirety. I need hardly mention that the most exciting opera in Toronto right now is another baroque masterpiece, namely Hercules. The director–Peter Sellars– has indeed given the work a production one might call bizarre, in dressing the cast in the clothes of our own century, making Hercules himself a victim of post-trauma stress disorder. The design brilliantly incorporates the ancient idea of ritual sacrifice by putting Hercules into a sort of fire-pit. He is indeed burned up by the poisoned cloak, as in the original story, yet informed by modern ideas making this very relevant & very powerful. Handel is one of the dramatists, but shares surely with the modern team who add a gloss upon the surface of the original. 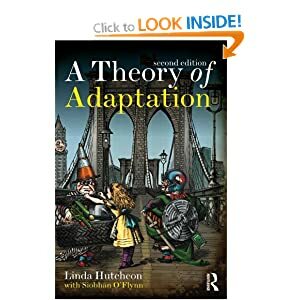 It seems a perfect demonstration of an effect Linda Hutcheon speaks of in her book about adaptation, where you can see meaning as though through several layers. Opera Atelier do not super-impose very much over Lully’s scores, although director Marshall Pynkoski does interpret opera boldly. He explains that historically informed performance still entails interpretation, and not attempting to simply reproduce what was done long ago. The result is sufficiently reliable that OA revive this opera regularly since their first production sometime around the year 2000. I recall how excited I was then, and how I’ve had to see at least one performance of each subsequent revival. It’s no more a “stilted entertainment” than any other opera. I know if I were to play Handel for some people of my acquaintance they’d laugh at this judgment. I find Lully very tuneful, the orchestral colours –as embodied in the sounds of Tafelmusik Baroque Orchestra–seductive, so much so that I always regret when the opera ends. The voices are not pushed the way they are even in Handel, let alone in Verdi or Puccini, which enables a level of expression one doesn’t expect in opera. The only analogies I can easily invoke for comparison are the arias Mozart wrote for Schikaneder in The Magic Flute: easy tunes that allow any singer to suddenly act (so long as they don’t become a ham). Rossini does similar things in some of his comic ensembles, enabling singers to do schtick while they sing. How can one act if one is struggling to sing? Lully got this long ago. In fairness I suppose Kerman is attempting to paraphrase the attitudes of his time, how others had judged Lully and so many other composers. I just don’t like how much fun he has heaping abuse on these neglected gems. And once you’ve seen these works performed you realize why they were popular in their time. In the meantime, Opera Atelier regularly brings such works back for our amusement. Persee opens April 26th at the Elgin theatre. Or you can also see their production on DVD. Don’t miss your chance to encounter Lully. This entry was posted in Books & Literature, Opera and tagged David Fallis, Joseph Kerman, Marshall Pynkoski. Bookmark the permalink.